Georges St-Pierre is a former twelve-time UFC Welterweight champion, a former UFC Middleweight champion, and a former two-time Universal Combat Challenge (UCC) champion. Georges St-Pierre is currently 37 years old according to his/her date of birth May 19, 1981. Georges St-Pierre is the real legend of UFC. He is the fighter who was able to outwrestle the best wrestlers, outstrike the best strikers, and submit the best BJJ fighters. It is believed that there is nothing GSP cannot achieve. Georges St-Pierre is a 3rd dan black belt in Kyokushin Karate, 1st dan black belt in BJJ, a black belt in Gaidojutsu, and a black belt in Shidokan. He started training martial arts to protect from school bullies. GSP is known as a surprise fighter when it comes to stand-up. He can throw everything, from a jab to spinning heel kick, and there is no possibility to predict his attack. He is known for his brutal kicks and world-class speed. He has excellent clinch control. Georges St-Pierre is one of the fighters with the best cardio in the history of UFC. 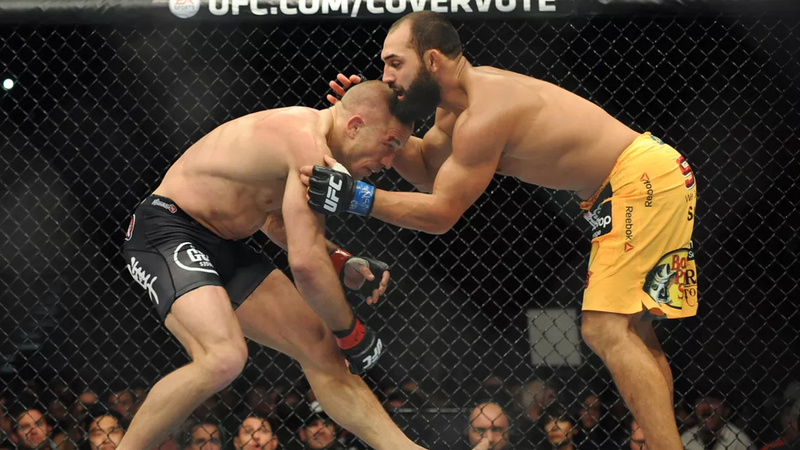 On the ground, GSP can throw elbows or punches but he prefers submissions. His favorite submissions are armbar (3 wins) and rear-naked choke (2 wins). Rush is also a master of transitions and he knows to switch from his back to a dominant position in the split of a second. Georges St-Pierre is on the second place for most title fights ever – 15, and the most successful Welterweight fighter of all time – 12 titles. GSP is on the first place in UFC by the number of unanimous decision victories – 10. Georges St-Pierre has made his UFC debut versus Ivan Menjivar at UCC 7: Bad Boyz on January 25, 2002. Rush won the fight via TKO. He joined UFC with the score of 5-0. Georges St-Pierre had his UFC debut versus Karo Parisyan at UFC 46 on January 31, 2004, in Las Vegas, Nevada, and won the fight via unanimous decision. His next rival was Jay Hieron at UFC 48 on June 19, 2004. GSP won via first-round TKO after only 1:42 in the first round. This was the fastest victory in his career. At UFC 50, on October 22, 2004, Matt Hughes defeated St-Pierre via armbar in the first round. The two fought in Atlantic City, New Jersey. Hughes is the only guy who submitted GSP. GSP then had one fight in a smaller promotion, and he later fought Jason Miller at UFC 52 on April 16, 2005. Rush also won via unanimous decision. Rush defeated Frank Trigg at UFC 54 on August 20, 2005, via rear-naked choke. At UFC 56, on November 19, 2005, GSP defeated Sean Sherk via TKO after a brutal barrage of punches and elbows in the second round. Georges St-Pierre faced BJ Penn at UFC 58, on March 4, 2006. In the toughest fight of his career, Rush won via tight split decision. His opponent was Matt Hughes again. The two faced at UFC 65, on November 18, 2006, in Sacramento, California, in the main event of the evening. In the second round, GSP dropped Hughes with a left high kick and finished the fight via TKO. He also earned Knockout Of The Night Bonus. Matt Serra and GSP faced at UFC 69 on April 7, 2007. Matt Serra surprised everybody when he rocked Rush with a tremendous punch and went on the top of him. Serra won the fight via TKO in the first round. After this fight, Georges St-Pierre had one non-title fight versus Josh Koscheck at UFC 74 on August 25, 2007, which he won via unanimous decision. All his next fights, with the exception of UFC 100, were the main events of the evening. In this third fight versus Matt Hughes at UFC 79, on December 29, 2007, GSP took a revenge by winning the fight via armbar. He also won Submission Of The Night bonus. The next opponent was Matt Serra at UFC 83, on April 19, 2008. This time, Georges St-Pierre won the fight via TKO in the second round. Rush defeated Jon Fitch at UFC 87, on August 9, 2008, via unanimous decision, and also earned Fight Of The Night award. Georges St-Pierre won BJ Penn for the second time at UFC 94, on January 31, 2009, via corner stoppage at the end of the fourth round. His opponent at UFC 100, on July 11, 2009, was Thiago “The Pitbull” Alves. GSP won the fight via unanimous decision. Rush next faced Dan Hardy at UFC 111, on March 27, 2010, and earned one more unanimous decision victory. Georges St-Pierre faced Josh Koscheck for the second time at UFC 124 on December 11, 2010. GSP won again via unanimous decision, earning his Fight Of The Night bonus too. GSP faced Jake Shields at UFC 129 on April 30, 2011. He defended the title successfully one more time via unanimous decision. 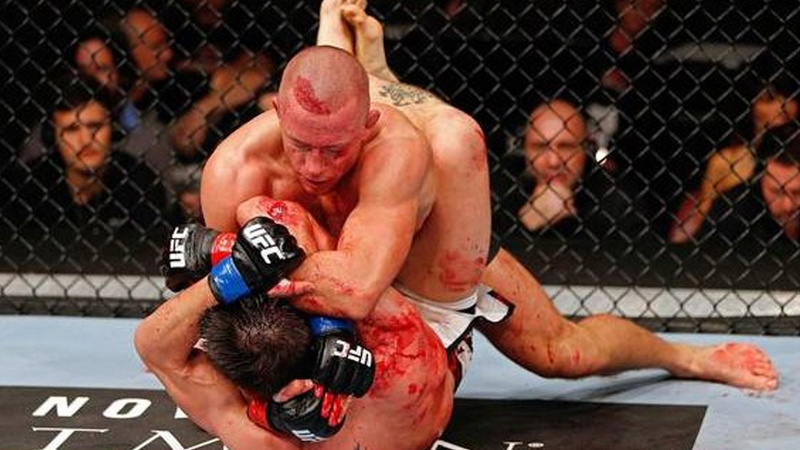 On December 7, 2011, GSP suffered torn right ACL and he was unable to compete for 10 months. 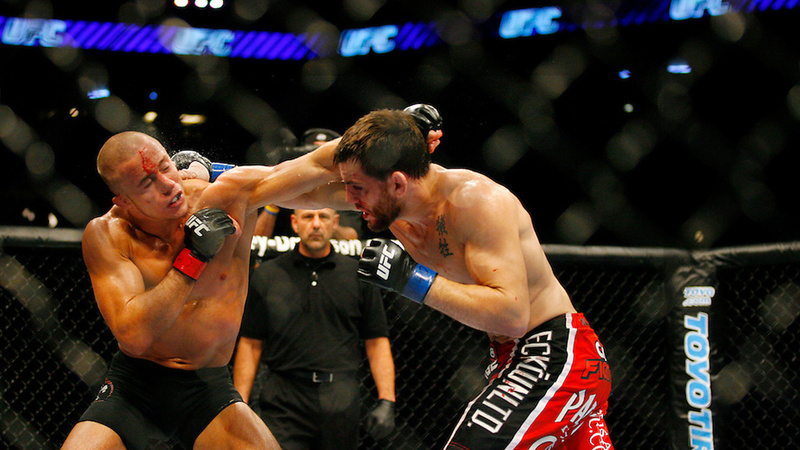 GSP fought Carlos Condit at UFC 154 on November 17, 2012. Despite Condit rocked St-Pierre via head kick in the third round, the French-Canadian superstar controlled him on the ground in the championship rounds and won the fight via unanimous decision and earned Fight Of The Night bonus. Georges St-Pierre faced one of the most controversial UFC fighters, Nick Diaz, at UFC 158, on March 16, 2013. 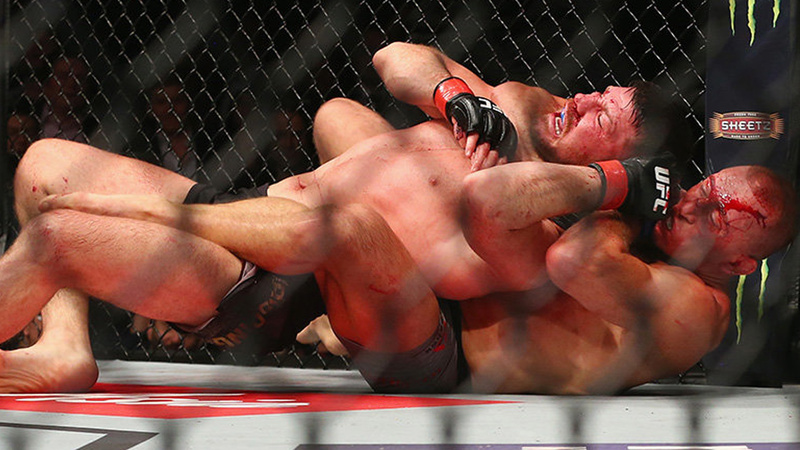 GSP was more than dominant during all five rounds and defeated Diaz via unanimous decision. The French-Canadian superstar controlled both stand-up and ground game. Of course, Diaz was throwing trash-talk during the match. After the fight, Diaz was saying that he is unhappy with the judge scorecards and he threatened to leave UFC. St-Pierre claimed he won Nick Diaz with ease but he wasn’t satisfied with the fight since he believed he could be much better. The two fought at UFC 167 on November 16, 2013. Despite GSP won via split decision and both fighters received Fight Of The Night bonus, it would be remembered as one of the most controversial decisions ever. Dana White stated it was unwarranted immediately after the fight, and each of sixteen MMA journalists’ scorecards claimed Johny Hendricks was a winner. 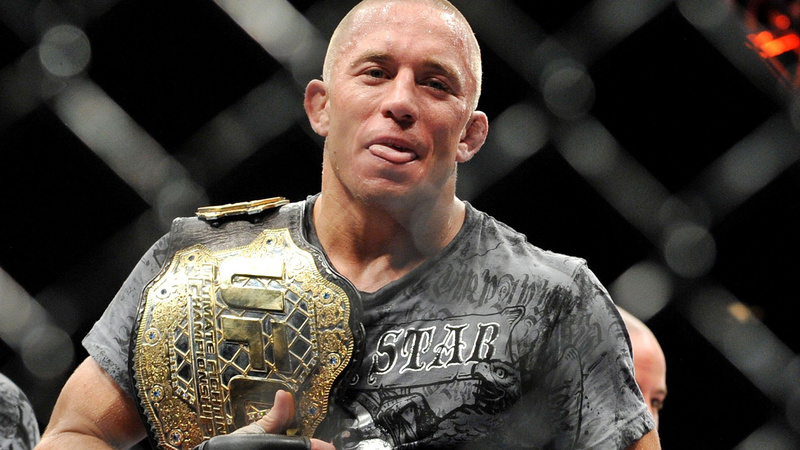 GSP claimed he should take some time off from MMA after the fight and vacated the title. In 2014, he tore his left ACL in the training session too, and it led to a longer break. The two faced at UFC 217, on November 4, 2017, in New York City, New York. Georges St-Pierre was dominant since the beginning and defeated Michael Bisping at the third round via rear-naked choke. He also received Performance Of The Night Award and became the fourth two-division champion in the history of UFC. GSP vacated the title 31 days after his victory due to his health issues. Georges St-Pierre successfully hides his private life from a public eye. There were rumors he dated Mandy Moore, which he declined. The last known thing is that GSP is spotted with the mysterious girl in South Beach but the French-Canadian superstar has never confirmed any info related to his private life. He is not married. Is Georges St-Pierre Joining ONE Championship? UFC Legend Georges St-Pierre Exited USADA Testing Pool Upon Retirement!